P.T. Michelle is the young adult pseudonym of Patrice Michelle, author of fifteen romance novels and novellas. When P.T. isn’t writing, she can usually be found reading or taking pictures of landscapes, sunsets and anything beautiful or odd in nature. What made you take the plunge and start writing? I've been an avid reader since I was in the 5th grade. I was fifteen and clearly remember the day that I closed a book with a happy sigh and said to my mom, "One day I want to be the author who writes books people sigh once they've finished reading them." My mom answered, "Then be an author". As if it were as simple as that. :) But what that conversation did do is put the thought in my head that I really did want to give this writing thing a go. I entered lots of newspaper contests when I was younger and even started a book in college, but a decade passed before I had the stick-to-it patience and I-will-succeed determination to sit down and complete my first manuscript. Nine years and sixteen books spanning two genres, I'm still writing. My college degree is in business and finance, not literature. For those who are unfamiliar with your novel; Brightest Kind of Darkness, how would you introduce it? Brightest Kind of Darkness is about a girl who dreams her entire next day every night when she falls asleep and the boy she meets, who never stars in her dreams. This story includes mystery, adventure, romance and even some horror. I'm currently working on LUCID (BRIGHTEST KIND OF DARKNESS, book 2). What was one of the most surprising things you learned in creating Nara? That in putting myself in Nara's shoes, I had to ask myself if I would've made the same decisions she did to save friends and family with the full knowledge, everything comes with a price. What part of Ethan did you enjoy writing the most? I definitely enjoyed writing the scenes between Nara and Ethan the most. I loved creating their growing closeness, weaving in the attraction and tension between them along with their secrets. Haha, see my list of the three words that describe me listed above. Hmm, I think I'm pretty much been asked everything. LOL! Hands down the worst job I ever had was a temp job filing carbon copies. Yes, CARBON COPIES, that thin tissue-like paper in pink/yellow/blue. In a windowless basement full of seemingly endless filing cabinets. The first week into this job, I think there must've been some divine intervention, because I got a horrible cold/flu (it was very rare for me to get sick in the summer). I was sick for two days and the temp agency replaced me. Talk about a saving grace. That truly was the worst job ever. Famous people are fun to watch on TV, but if I were stranded on a deserted island, I'd want my family with me. Well, maybe I'd want Bear Grylls from the Man Vs Wild TV show to be there as well. Otherwise, we might all perish. LOL! Author's note: Brightest Kind of Darkness is a novel length dark paranormal YA full of mystery, adventure, romance, and even a touch of horror. It's suitable for ages 14 and up. This is the first book in the BRIGHTEST KIND OF DARKNESS series. Thank you P.T. for making this giveaway possible. 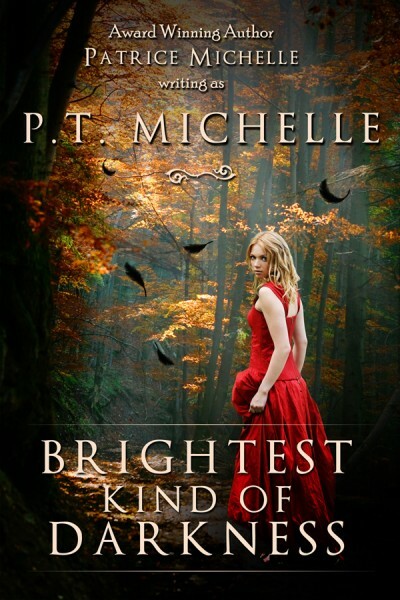 2 Winners will receive one e-book copy of Brightest Kind of Darkness by P.T. Michelle. Probably my husband's wedding ring, or when my family all pitched in together to get my mother her computer. The most expensive gift I ever gave anyone was probably when I bought my husband really good seats to see Kelly Clarkson in concert :) He was super happy! I bought Diamond ear rings for my mom or A TV for my Boy friend. A necklace for my mom! Laptops for my son and daugther! The most expensive gift I have given was a Swarovski crystal heart to my Mom and Dad for their wedding anniversary. The most expensive gift I've given someone was front row tickets to a musical. Sky Sports - it costs me about £40 a month! Imagine how angry I was when I saw it a year later in a book fair 85% off! A day at a spa with mom. A PS3 for my kids! a lotion.. to my ex grrrr!! I could have spend it to buy some books instead..
A pearl necklace to my mother.